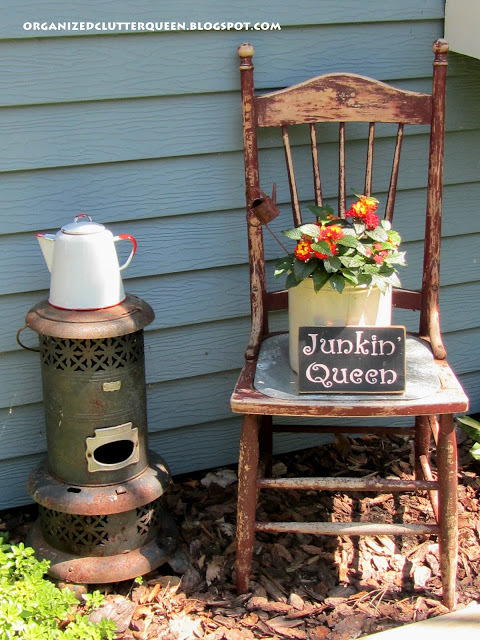 Here are two of my old favorites in the junk garden...my weathered gray chair and my Perfection heater. Both have been in the garden for a lot of years, AND the elements have taken their toll. 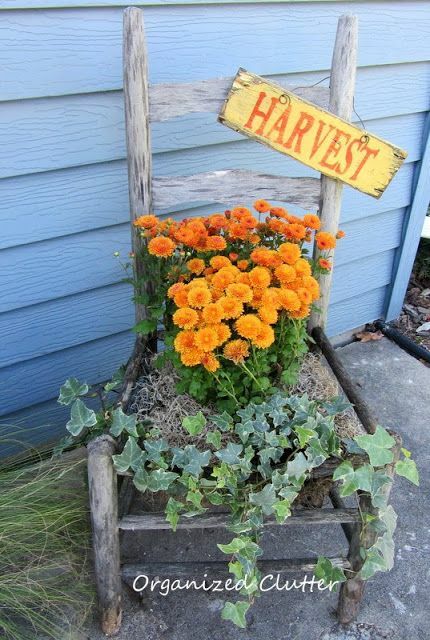 This year the dowels that held the chicken wire planter rotted off, and I improvised by setting a pail inside the chair. The chair's useful life is almost over. I had the chair on my deck long before I started blogging in 2011. In one of my very first junk gardening years, the old chair is behind all of those pots and pans planted with flowers. The chair hadn't even weathered yet! Here it is with a yellow trailing petunia and rosy colored verbena. 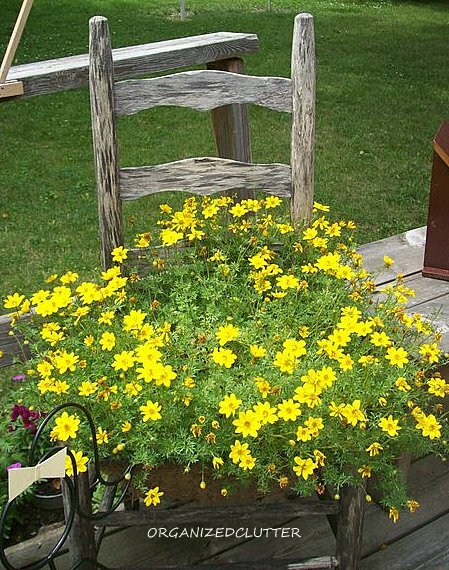 One season the chair was overflowing with yellow Bidens. 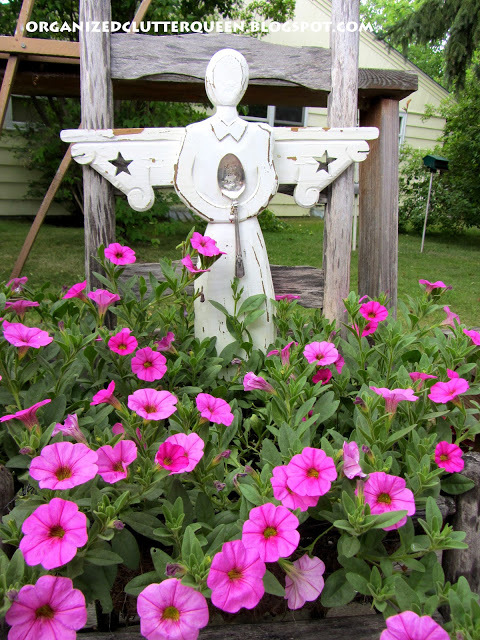 Again on the deck with petunias, and a garden angel. Last year I moved the chair from the deck to one end of my front yard garden. And finally, here it is last fall planted with mums and ivy. I will miss this old chair! The old Perfection stove is missing a leg. It rusted right off. I have it propped up on one side, and the prop is hidden by the plants. I also found an older photo, also from my early junk gardening years, of the Perfection stove. It wasn't even rusty yet! I sure loved using the stove in my vignettes. Last year's vignette with the stove is my very favorite! Where are the old chair and Perfection stove now? Behind the house in an area not seen by many, "rusting and rotting in peace". This garden has succulents, creeping phlox, dianthus, sea thrift and maybe a few other low growing perennials. To prolong the life of old wooden junk in my gardens, I seal them with Thompson's Water Seal. It does help, and now even comes in an aerosol form. I hear you. I tell my neighbors that I can't get too attached because, for us, the heat just eats it up. My little wheelbarrow lost its wheel this year. So I am on the lookout for a newer one. But, at least you have ground cover to hide the imperfections. I just have rock!! "Rust in Peace"... Love it! : ) Beautiful garden, too! 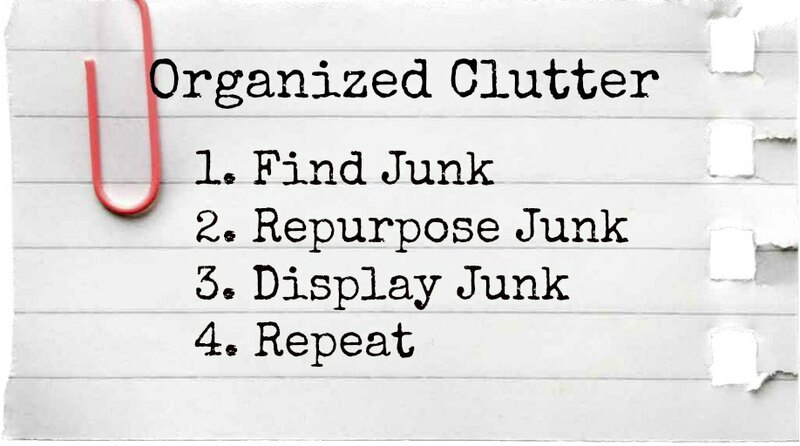 I just love your junque.............I put out a few of my things out today. I had an old, blue, weathered chair that I loved...but...hubby saw that it was rickety and broke it up and tossed it on the wood pile. I am still angry. Then, this spring he tossed out some great junk that I was saving....What am I going to do with that man? I have a new storage bin to save my stuff in so I hope that helps! I think I need to get some of that water seal for next year. Your garden is beautiful! I know what you mean ... It looks so wonderful as it ages, but then it doesn't last. I'm glad you have photos if all your junk garden trinkets! I just seeing all the fun old pieces you have in the garden. 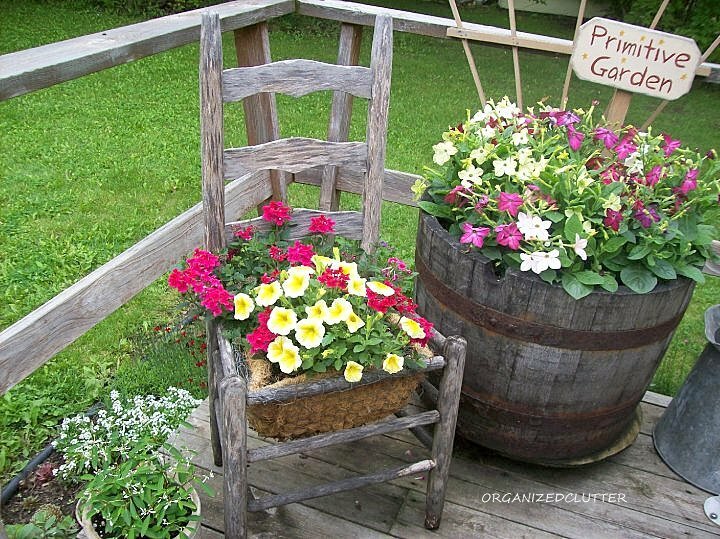 Gives such whimsy and character to your pretty flowers. Love the "Rust In Peace" sign and chair. Too cute. Rust in peace! I love it!! We are getting ready for landscaping and you know I'll be referring to your blog with all of it's beautiful gardens more than once!! So much inspiration here. Thanks! I, too, love the Rust in Peace sign. They added so much, hard to give them up.